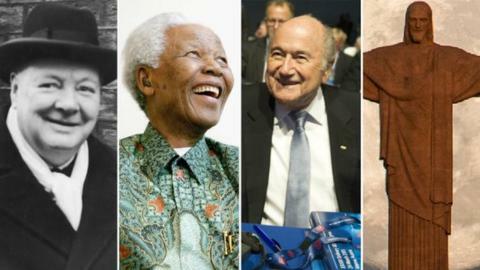 Sepp Blatter has been likened to Jesus, Nelson Mandela and Winston Churchill as 10 Concafaf members gave their backing to the incumbent for the Fifa presidency elections in May. The declarations were made at the Confederation of North, Central American and Caribbean Association Football (Concacaf) congress. Dominican Republic FA president Osiris Guzman compared the Swiss to iconic historical figures, also including Moses, Abraham Lincoln and Martin Luther King. "Membership is sending a message that we continue to support Blatter," said Concafaf president Jeffrey Webb. Blatter is one of four candidates. The others are ex-Portugal international Luis Figo, Dutch FA chief Michael van Praag and Jordanian Prince Ali Bin Al Hussein, who, along with Blatter, were all present at Thursday's congress, but did not give speeches. The Trinidad & Tobago Football Association praised Blatter, 79, as the "father of football". The heads of football federations from Jamaica, Haiti, Turks & Caicos, Cuba, Panama, St Vincent & the Grenadines and Puerto Rico also expressed their support for Blatter, who is seeking a fifth term in office - having been in power since 1998. There are 41 Concacaf member associations. The election will take place in Zurich on 30 May.